Some will call us crazy.. We probably are.. But this idea was just too cool not to attempt. When banjo innovator extraordinaire Bela Fleck threw the idea our way and said, "Gold Tone is probably the only banjo company in the world that would ever try something as wild as this", we just had to do it. After some serious brainstorming and a few prototypes, the BG-10 was born. It was such a cool banjo, that we decided to add it to the line so that the world had an opportunity to experience it! The BG-10 is a 10-string banjo (think 12-string guitar). The strings are arranged in pairs with unisons on the first, second, and fifth string, and octaves on the third and fourth. 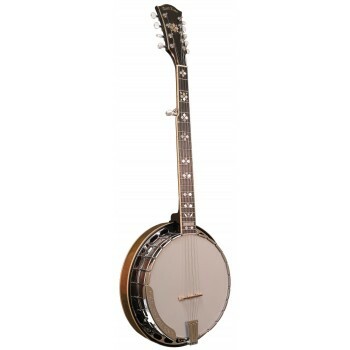 This banjo is easily played by any five string banjoist as the fingerings are all the same. The tone is loud and penetrating with added sustain caused by the extra string tension. To reduce unwanted overtones we have used our extended 3-ply lathed wood tone rim which eliminates the tone ring and the associated weight. This is not your grandfather's bluegrass banjo so no rules need apply!